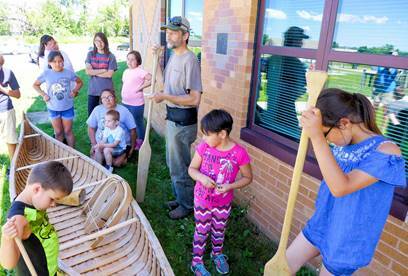 3-5 pm In the EFS green space, canoe artisan Erik Simula will engage youth and families with constructing our 20’ traditional Ojibwe birch bark canoe. Meanwhile, in the EFS classroom, volunteers will engage kids in crafting their own mini-canoe paddle by sanding and decorating wooden paddle blanks and their own mini-canoe by cutting, folding, and seaming birch bark cardstock. 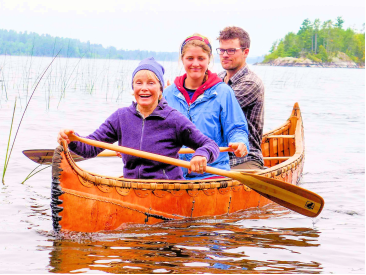 6-8 pm At Semers Park beach, kids, youth, adults can enjoy paddling a birch bark canoe with an EFS guide. We’ll have paddles and some life jackets, but parents are encouraged to bring their own pfds for their kids if available. We’ll also have other canoes and volunteers available to assist those who’d like to learn basic canoe strokes for bow and stern. RSVP’s are much appreciated so we can plans for paddle kits, pizzas and canoes. RSVP by phone (218-235-0138) or email to let us know you’ll be coming!